The exercises took place on the sidelines of RIMPAC 2014. The Japaneses Self-Defense Forces (SDF) exercised amphibious landings this month with U.S. forces in Hawaii, according to the Associated Press. The Japanese military has emphasized amphibious landings recently as tensions have risen with China over the sovereignty of the Senkaku/Diaoyu Islands specifically and more generally in the region. In any scenario where Tokyo would have to reclaim territory it currently administers through the use of military force, it would need to be ready for an amphibious landing — one of the toughest imaginable scenarios for a modern military. Japan first drew attention to its interest in honing the SDF’s capability to wage amphibious warfare last October when it announced an exercise involving 34,000 troops performing a similar drill in Okinawa. The SDF’s interest in island warfare clearly stems from the possibility of conflict with China over disputed islets in the East China Sea. 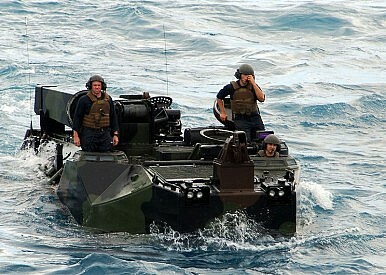 The Naval Diplomat, James Holmes, describes “seizing an island held by dug-in invaders” as one of the “stiffest challenges amphibious forces face.” For the Japanese military, the prospect of retaking an island is very real, hence the emphasis during the last year on amphibious landing exercises. Additionally, with the Japanese government’s recent decision to pass a resolution reinterpretating the Japanese constitution’s ban on collective self-defense, Japanese forces may find themselves fighting outside of their immediate neighborhood.